Our dietary supplement Neurex is the result of many years’ research. It combines the beneficial effects of several natural extracts: Ginkgo biloba, Curcuma longa, Bacopa monnieri, Huperzia serrata, Gotu kola (Centella asiatica) and rosemary leaves. Other ingredients have been added to maximise the efficacy and bioavailability of the active substances, such as Bioperine® which helps improve the uptake and absorption of curcumin. Other ingredients include Acetyl L-carnitine arginate, glycerophosphocholine, idebenone, ferulic acid, uridine monophosphate and l’ExtraFolate™. Combined in a single capsule, all these molecules act synergistically in the body. inhibiting the activity of acetylcholinesterase, so protecting levels of acteylcholine, one of the body’s key neurotransmitters. help regulate levels of homocysteine. 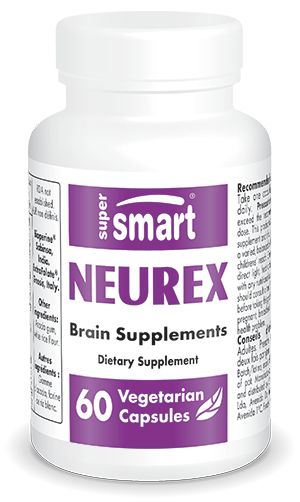 Our dietary supplement Neurex brings together a number of active substances for maximum efficacy. They are combined in a single capsule for ease of use and absorption by the body. Simple to order on-line, this supplement is offered at a suggested dose of one capsule twice a day, though this can be adjusted according to your preferences and the advice of your therapist. ExtraFolate™, Gnosis, Italy - Bioperine® is a registered trademark and patented product of Sabinsa Corporation.